Just read in The Advocate about the awarding of the contract to build 100 buses for Metro has been awarded to Southern Propsects of Wynyard. It is likely that they will be assembling and fitting out a design from on overseas builder rather than building from scratch. One theory is that it might be Gemilang using the body similar to the Scanias in use with Transdev, Melbourne, However there has been no indication so far as to what chassis supplier is involved. Gemilang have also bodied on Merecedes low floors. As with all things only time will tell. In an update it appears the new buses will be Cummins powered Bustechs. Last edited by 1whoknows on Mon Feb 20, 2017 5:13 am, edited 1 time in total. Well, 2017 is in full swing, and as usual, before the start of the school year, a few additions to fleets occur. In the latest news of buses in Tassie, Tasmania's own Redline have purchased a second-hand Denning Silver Phoenix (ex Doyles QLD) (see photo section for pics) and added a new BLK Cityrider articulated 79 seater, to replace the one damaged by floodwaters in June last year. Currently being signwritten when photographed, they'll be ready for service when the school year starts in February. In the south, Cresswell Coaches have purchased from N.M & L.M Boulton at Dover, one of their earlier Mercedes Benz OH1830L / SB400. 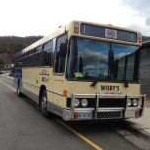 If anyone is attending upcoming Car & Truck Shows in the north, the Tasmanian Bus & Coach Society will be displaying their B58 'Tassie Bluebird' alongside a couple of Flxible Clippers and others. FEB 12th, is the Tasmanian Truck Show organised by Lions Club of Deloraine held at Quercus Park Carrick. This will also include trucks from the TAS branch of American Truck Historical Society, whilst FEB 19th is the Deloraine Classic & Custom Car Show on the streets of Deloraine. If you're about, come and say hello, perhaps JOIN the Tasmanian Bus & Coach Society and get involved with our restorations. Tasmanian Truck Show done and dusted, Westbus #12 (Mercedes OH1316/Ansair) took out Best Mercedes in show under our care! In Tasmanian Bus & Coach Society news, the Deloraine Classic & Custom Show done and dusted also. Great opportunity to network and get the Society's name out there. No prizes this time, however it was really more about the old cars rather than the small bus presence. Bus #200, the 1st low-floor in Australia, is currently being stripped and completely repainted back into it's original 'special' livery, quite appropriate, considering this year celebrates 25yrs since it was introduced. Once repainted, the Society will apply the signwriting (supplied by Signrite) whom originally did all the signwriting when new. From there, it will be on display at the Tasmanian Transport Museum, replacing Society #134. #52, Maxwell's AEC Reliance / Denning will commence restoration within the next month. Other upcoming events for the Society are the Launceston Motor Show (2 April), Devonport Motor Show (26 Mar) and in association with the TTMS, the TBCS will display buses at Shannons Show & shine (9 April). So plenty on the go with the Society. Well, the Tasmanian Bus & Coach Society is moving along nicely. #200 has been completed, with restoration finished, re-launch successful and on display for all to see @ TTMS. The Society's next project gets underway fully this weekend, with the commencement of restoration works on Maxwell Coaches' 1963 AEC Reliance / Denning. This major project for the Society has been a long time starting (in earnest) and even this far down the track, will take over 2yrs to complete. The Society will be posting progress on BA, as we did with the restoration on #200, so keep your eyes on the Photo Section in upcoming months. Wisbys Buses have just taken delivery of a 2008 King Long "6126AU" Hino RN8J from Keatings Coaches Gunnedah fresh off the spirit today and arrived safe n sound in Margate. wisbydriverB40 wrote: Wisbys Buses have just taken delivery of a 2008 King Long "6126AU" Hino RN8J from Keatings Coaches Gunnedah fresh off the spirit today and arrived safe n sound in Margate. Sorry, what brand and model are the new artics? Jeffery5878 wrote: Sorry, what brand and model are the new artics?